One of the most interesting human invention is the high-speed ships with dynamic support. There are several types of such ships: planing craft, hydrofoils, ekranoplans, etc. My father devoted his life to developing hydrofoils and air cavity ships. Hydrofoils, similar to airplanes, use wing surfaces to generate lift. Since water density is much greater than that of the air, the area of hydrofoil surface can be very small compared to airplane wings. 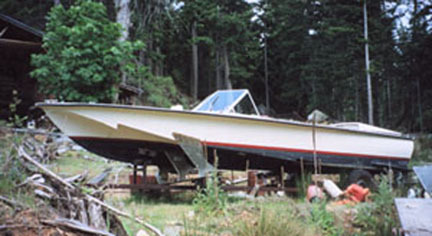 Different types of hydrofoils were developed in Western Europe, USA, Far East Asia, and even New Zealand and South Africa. 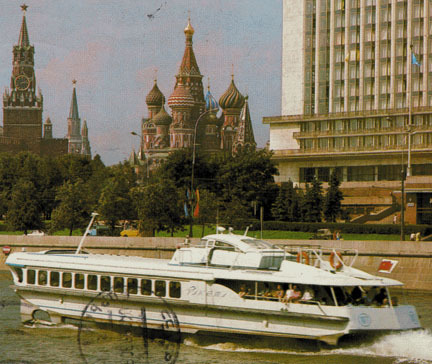 About 80% of all hydrofoils were built in the Soviet Union. Rostislav Alekseev, the founder of the soviet hydrofoil shipbuilding, designed the first soviet ship Raketa. 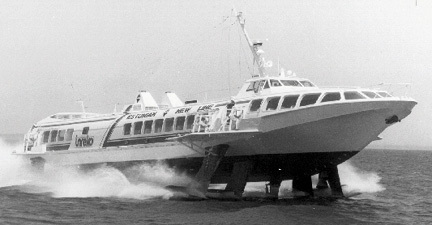 Central Hydrofoil Design Bureau headed by him developed a number of commercial hydrofoils, several military hydrofoils and unique large monsters flying over water, ekranoplans. 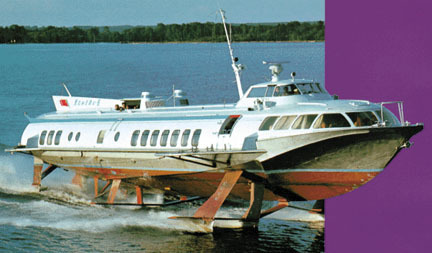 Below is a gallery of some Russian-designed hydrofoils. Given specifications may vary for a particular vessel. Olympia is one of the recent hydrofoils. This vessels has outstanding seakeeping qualities, ability to operate in darkness, and reliability and simplicity of operation. She can go on foils at wave height up to 3 m (3% accidence). Full-load displacement 138 tons, speed 37 knots, passengers 250 prs, range 300 n.m.
Cyclone is the gas turbine commercial hydrofoil. She can go on foils at wave height up to 2.5 m. Full-load displacement 150 tons, speed 42 knots, passengers 250, range 300 n.m.
Katran (Kolhida) type ships have been widely used around the world, and in particular, in the Medditeranian Sea. She can go on the foils at waves of up to 2 m. Full-load displacement 74 tons, speed 34 knots, passengers 140/150, range - 200/150 n.m.
Polesye was designed to operate in shallow waters. Full-load displacement 20 tons, speed 36 knots, passengers 53, range 220 n.m.
Voshod is the best fast ferry in its class of smaller vessels. This hydrofoil is able to operate in foilborne conditions in waves up to 2 m in height. 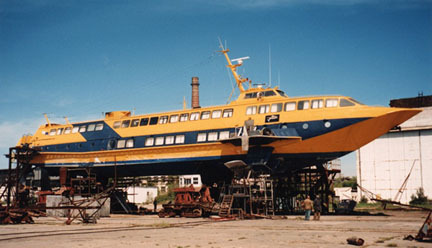 Full-load displacement 28.4 tons, speed 33 knots, passengers 71, range 280 n.m.
Kometa is the first Soviet sea-going hydrofoil. She was a very popular transportation means in Black and Medditeranian Seas in several last decades. Full-load displacement 59.5 tons, speed 32 knots, passengers 106-120, range 240 n.m.
Meteor is the most popular and ecoomical river-going hydrofoil ferry. Full-load displacement 54.3 tons, speed 35 knots, passengers 124, range 600 km. 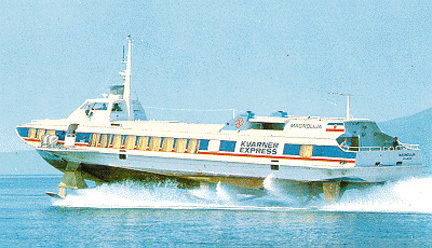 Volga is a small hydrofoil vessel. Around 6,800 boats have been built. Full-load displacement 1.9-2.6 tons, speed 29-33.5 knots, passengers 6, range 97-160 n.m.
Raketa is the first Russian hydrofoil. The first ship was built in 1957. 400 vessels have been built and some of them continue to operate. Full-load displacement 26.2 tons, speed 32 knots, passengers 64, range 500 km.